We supply and install the latest Voice over IP based phone systems for small to medium sized businesses. These include SIP trunks along with regular phone lines. Designed with the small and medium sized enterprises in mind, supporting up to 500 users and built using the very latest technology, the Yeastar S-Series delivers exceptional cost savings, productivity and efficiency improvements, delivering power, performance, quality and peace of mind. The all new S-Series is engineered for the communications needs of today and tomorrow, and with the Yeastar unique modular design future proofs your investment choice. The S-Series features fast installation with comprehensive auto provisioning, advanced plug and play capability, together with an intuitive Metro UI driven by point-and-click configuration, from any location. A unique modular design, the S-Series will install into the most demanding of environments. You can also take advantage of advanced enterprise grade features with the fullest and most complete software versions. Telephone System without Risk S-Series is built with the future in mind, utilizing the latest technology advances, from Freescale industrial grade Quad Core processors, TI DSP voice processors, and long-life power units and lightning protection. Play Safe and Expect Reliability With advanced failover, security, monitoring and reporting capabilities as standard, combined with an internal firewall and with support for TLS and SRTP encryption, there has never been such a robust system. 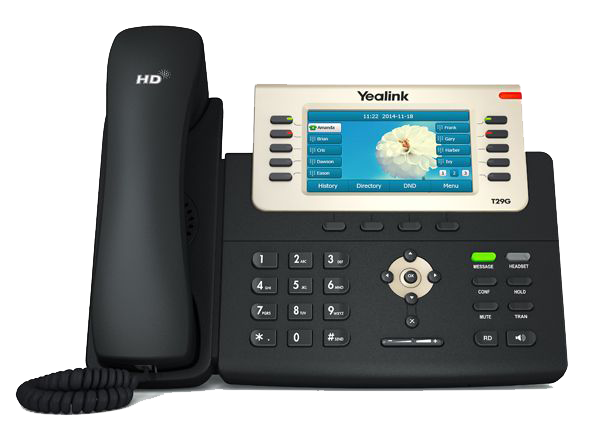 The Yealink IP Phone T2 series represent the next generation of VoIP phones specifically designed for business users who need rich telephony features, a friendly user-interface and superb voice quality. T2 series offers high-definition voice quality through HD handset, HD speaker and HD codec (G.722). The large, high-resolution graphical display, combined with up to 48 keys, guarantees an excellent user experience in terms of configuration options, making calls and access to the express XML browse. In addition, to ensure that your audio data remains confidential, it also supports security standards TLS, SRTP, HTTPS, 802.1X, Open VPN and AES encryption. These protect against electronic eavesdropping and data theft.